Hope everybody celebrated Father’s day with great fun. We celebrated father’s day with a decent lunch and dinner menu, but we didn’t go out or grill anything. But we had a wonderful food and watched group finals in Euro-cup Soccer/Football game between Portugal and Holland and in the end Portugal won the game and advanced to quarter finals with Czech Republic. My hubby likes American Foot ball, Cricket and Soccer (which is his favorite games). We watch Golf (meaning TV will be on all through the game) but nobody sits and watch. I usually ask hubby if Tiger (Tiger Woods) is winning. He will say he is there but not playing well. That is the end of game. We both like the greenery of grass in Golf field, may be that is the reason TV is ON in spite of nobody watching it. Comeback to Dads: I meet two dads’ in my life, one is my Dad and other is my hubby. My Dad was strict, but loving and always making sure that I and sister had everything for school, clothes etc. He loves movies that were his only entertainment. In my child hood, every few days we are going to movies. Going to movies is always fun, but coming back, me and sister would be sleepy and would not want to eat anything. Then we will get scolding from him for not eating the food. He always makes sure that we have to eat before we go to bed. He gave both me and sister good higher education and made us better individuals. While back from his work, he will not fail to bring us something to eat. We always check his bag whether any goodies is there. Last time when we visited India, he even bought parippu vada for his daughters and son’s in-laws. He like gadgets especially a camera, now he has become expert in Mobile phone. He is learning Hindi at his old age from his grandson and granddaughter as they speak only Hindi in Delhi. Then my hubby Dad, who loves his daughter like crazy, even when I scold her for something, he will say don’t scold her, she is too young to understand. She is my baby and so on. Both she and her brother won’t take a nap on weekends when their dad is around. Both of them think that they will miss some action, so not to sleep when dad is at home. I can understand 3 year olds enthusiasms, but 5 month old is hard to fathom, I guess he also does the same as his sister. My hubby loves gadgets too and, he is crazy about photography; he clicks in split seconds mode taking several pictures in a minute and gets all sorts of facial expression. I will tell you one secret; he is the one who took my photo very nicely for the first time. He took such photos of mine that I felt I can be photogenic too. Now both Dad and daughter are mastering I-Pad, which I am lagging behind. May be I will learn with my Son one day. My princess is model for his photography. She knows how to stand; Dad knows how to take pictures. She joins in him in cleaning the house, vacuuming even with her own mop and small walker which she has turned into her vacuum cleaner. When wakes up in the morning she asks where is papa? On weekdays I will tell her that he gone to work. When my hubby comes for lunch, while she is at school, he will say, house is so quiet, if Nidhi is not around; this does not looks like house. He will always wait for Nidhi to wake up from the bed to go for shopping during weekends. When I am driving, I will switch off the music, radio and so on. But when she is with my hubby, they will both likes to play music and even she is dancing and enjoying the song while in the back seat. So they are always fun team. Coming back to today’s recipe. When I called my dad today and told him that I am going to make Payasam or pudding with forbidden rice/black rice which I bought from latest trip to Whole Foods. I like to shop there as I get lot of new varieties of flours and grains. Even though I am from 3 time rice eating part of India, I haven’t seen forbidden rice there. I have seen recipe with them in Internet. So always curious to buy and bought a little about a cup so that if I don’t like then I won’t cry so much that I wasted so much money. My dad told me why you don’t add some spilt mung beans and some fried cashew nuts, then it will make more delicious. I decide to add that. Then while making my hubby dear told me can you add some toasted coconut pieces, it will give some nice crunch while having the pudding. So I decided to add that one too. So this recipe has contribution from both dads. After tasting, my princess gives me thumbs up; she does say way when my hubby does a taste test. With two finger touched and a nod with a head that this is really good. 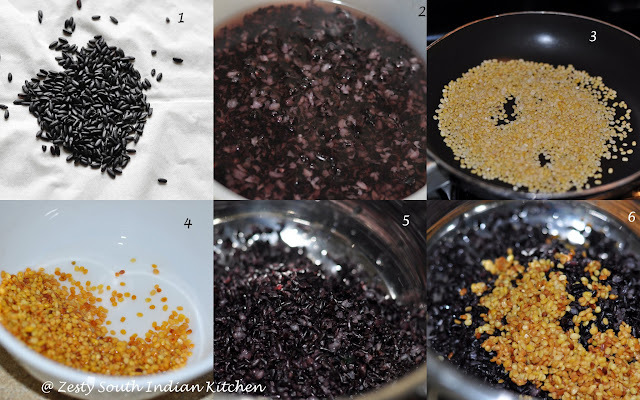 Forbidden rice/Black rice /purple rice is kind of heirloom variety of rice rich in nutrients, amino acids, fiber etc. Chinese people believed that it is good for kidney, stomach and liver. At first I thought that it is originated in China, by reading Wikipedia, I came to know that it is originated in North-east part of India, Manipur, read more from here. It is called Forbidden rice, according one story, as Emperor’s of ancient China has only access to this rice and it is not available for the common man at that time. When I typed black rice pudding, almost tons of Thai style black rice pudding comes up in Google with mango or other fruits on the side. Then I found another variation, as Burmese black rice, which is sweetened black rice with toasted sesame seeds and grated coconuts. I want to give an home style touch to this black rice pudding, so included spilt moong beans cooked both very well. Then added Jaggery and cooked further and added coconut milk. Finally spiced up with cardamom and garnished with fried cashew nuts and toasted coconut pieces. These turned out to nutty delicious dish, for my hubby it reminded him of arrowroot Payasam/pudding he had while grow up with. You need to soak the black rice overnight to get an easy cooking time. Otherwise it will take about 45 minutes to cook. Here goes the recipe. Water : 4 cups( cooking rice) + ¼ cup water for melting jaggery. Soak the forbidden rice/ black rice for about 8 hours or overnight in 4 cups of water. Next morning in a small skillet dry roast the spilt mung beans for about for 3-4 minutes or until they become golden brown color and release a nice aroma. Set aside. Clean the rice along with spilt mung beans in running water and add 4 cups of water and pressure cook for about 11 minutes or 4 whistles and set aside. In a stove top you may need to cook about 30-45 minutes or until the grains become soft but retain it shape. While rice and moong beans are cooking in a small pan heat jaggery with ¼ cup water and bring it to boil so that jaggery get melted completely. 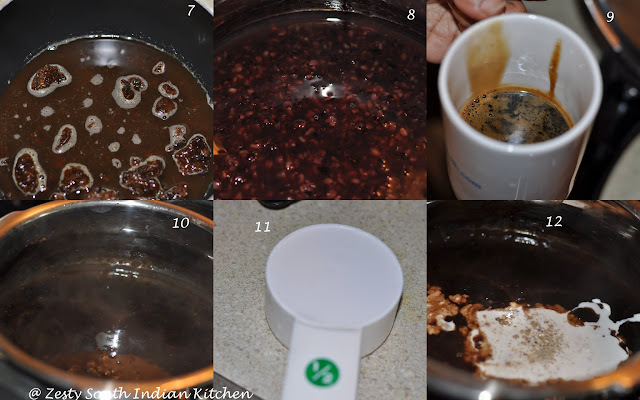 Strain and remove the impurities and set aside Jaggery water. 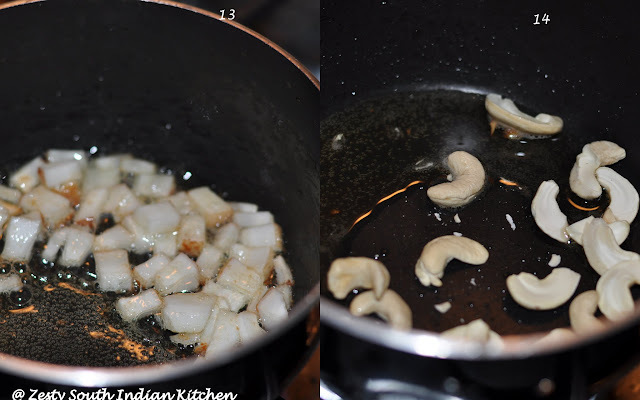 When pressure is removed from the cooker, remove the lid and jaggery water and cook for about 6 minutes. To rice- jaggery- mixture add 1/2cup coconut milk switch off the flame. Then add crushed cardamom. In a small pan heat coconut oil or ghee and fry chopped coconut pieces and cashew nuts until they become golden brown, remove from the fire and add it to cooked rice mung beans pudding. I am linking this to Hearth and Soul blog hop #105 hosted here. Wonderful to read this post. I can totally relate to the sports part. Its crazy at my house too. The info of black rice is really interesting. I have used mixed rice, which as all colors. This one looks very interesting. I have seen black rice in the blogs only and this looks wonderful. with such an unique colour everyone would love this. Wat an irresistible pudding,seriously cant take my eyes from ur clicks. Sounds nice, really very unknown to me……….pudding looks delish. Once again…I just loved reading your post, Swathi. You certainly have a lot to say that is so entertaining, and informative. Love the ‘Nidhi’ stories, and your childhood stories. As for me, I didn’t include any childhood stories in my ‘Father’s Day’ post. Sometimes I get too sentimental about them, so I kept my post short this time. Love the term ‘forbidden black rice’ Wow! I will have to get some from our local Whole Foods. Never in my life did I have black rice pudding…it almost looks like dark chocolate and rice pudding. So smooth, creamy, and delicious! Glad you and family had a nice Father’s Day…as did we! What a fantastic black rice pudding! Healthy pudding,Njan ethu try cheyyam ennu vicharichu rice meadichu,oru nutty taste undu ennu parayunnathu sheriyano? Cheriyanu Suja, it has nutty taste, but we will like it. Try cheyyaithu nokku. ishtapedum. I think if you had put this pic up for a guessing contest, hardly anyone would have been able to guess ‘forbidden rice’ or ‘black rice’ 😀 I’m learning about it first time today. Interesting to know you had inputs from both dads, the pudding looks good! Its only my husband who watches Golf but sometimes I sit with him just to give company. How old is your daughter? she can’t be a teenager that’s for sure because I can tell that from experience. Swathi, I have never cooked with black rice and you made payassam with it. And great to read that your Dad suggested to add split mung and cashews. This is really interesting recipe. That’s an creamy and delectable pudding….looks drool worthy…..
That pudding looks so good! I love the combination of black rice, mung beans and cashew in it! Totally healthy and yummy! What a unique and delicious looking dessert! I looove cardamom and rice pudding, so I think I would love this. What a delicious looking pudding and something different than anything I’ve had before! Thanks for sharing and for letting us know where to get this rice! It’s good to see that you have such a great relationship with your dad! I haven’t seen this rice before! I like how your recipe came about with everyone giving you ideas. It sounds and looks delicious! Such sweet stories too. Nice post, and the pudding looks delicious, have never tried forbidden rice..
Hi Swathi happy to see your wonderful comments in my blog….Nice idea of making Delicious black rice pudding looks yummy…When I stayed in Vietnam I saw this black rice in Gourmet shop.But I have not dared to buy because so expensive…Those days my husband told me about the name of the rice in my language also.If I saw this rice in any malls..next time sure I will try this wonderful healthy pudding..book marked. I have never tested that pudding it looks delicious and for me is very original and a tentaption. Thanks for sharing. That is so lovely that both your Dad and your husband contributed ideas for your pudding! I was very interested to learn about Forbidden rice. I have seen black rice but only in savoury dishes – your pudding looks wonderful! Looks so good Swathi, love the color and the creamy pudding. We love forbidden rice; but, I had never considered using it in a dessert. This looks fantastic. I love how both your husband and your dad contributed to this recipe. Your pudding looks wonderful!